How to choose a good hiking watch that won’t break your bank? Nowadays, watches aren’t just for time tracking purposes. In fact, watches can be used in various circumstances. One variation of specific-purpose watches is hiking watch. Hiking watches offer a myriad of functions and features that hikers appreciate, such as altimeters, digital compass and the like. Just like other products, the watch world is divided into different markets in which watches are specially made to suit customers’ budget and preferences. Nevertheless, that doesn’t make the task of finding a suitable watch less challenging. 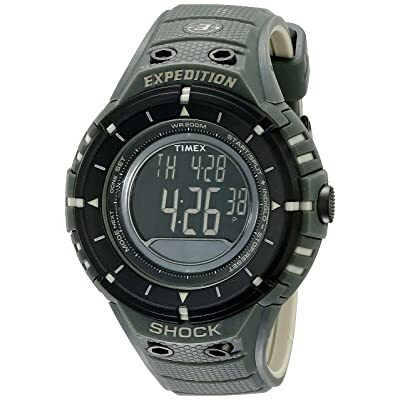 What you will find in this article is a list of best hiking watches under $100 for men that I have specially chosen based on my own research and experiences. What’s more, you will also find a guideline in which I show you the essential features you should look for in an under-$100 watch. Enjoy! Suitable for most weather conditions and tough terrains. It is safe to say that Casio SGW1000 is a rare find in the watch world. 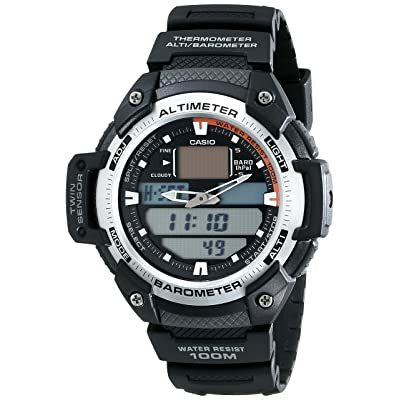 This digital watch does offer not only an affordable price but also numerous essential features, such as the triple sensor. This sensor includes what hikers or any outdoor sports players would wish to have: a thermometer, barometer and digital compass. These three features provide you with the direction, air pressure and temperature, which could be crucial for the decision making during the hiking trip. 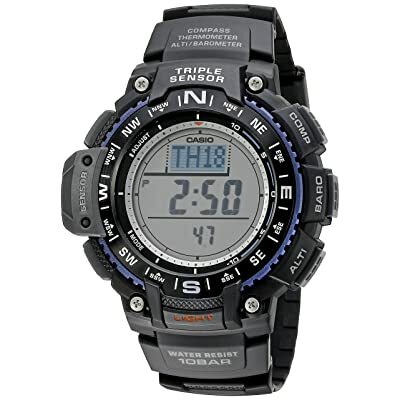 Casio is a prominent name among watch manufacturers, especially for their products’ durability. This item is not the odd one out. SGW1000 is shock-resistant, meaning it can withstand tough hiking trails with mud and dirt. Plus, the water resistance is up to 330 ft. That allows you to wear the watch in most weather conditions, wet and muddy terrains. 330 ft, however, isn’t a suitable rating of water resistance for diving. Many people may appreciate the world time feature, especially those who want to keep track of two time zones at the same time. The thermometer and barometer do not give accurate measurements, making it the biggest drawback of this watch model. However, given the price and all its must-have functions for a hiking watch, Casio SGW1000 is a good choice for those who value its functionability and adaptability. The Casio SGW400H-1B has a sporty look, which is perfect for outdoor outfits. Both case and wristband are made of high-quality resin for more toughness and durability. Resin is a ideal material for watchmaking, especially for outdoor watches, thanks to its durability and affordable cost. It is also known as a high-impact quantifiable substance which resists shock effectively. Resin-made watches are easy to use and last quite long if you know how to take care of it. This model offers twin sensor: barometer and thermometer, these features are excellent companions for hikers. The watch displays barometric interpretations, which can be used to read altitude measurements. Once you know how the ISAV (International Standard Atmospheric Values) works, it is easy to recognise the tendencies of weather changes, thus making correct decisions for your trip. The thermometer offers a closer look at the temperature shifting. 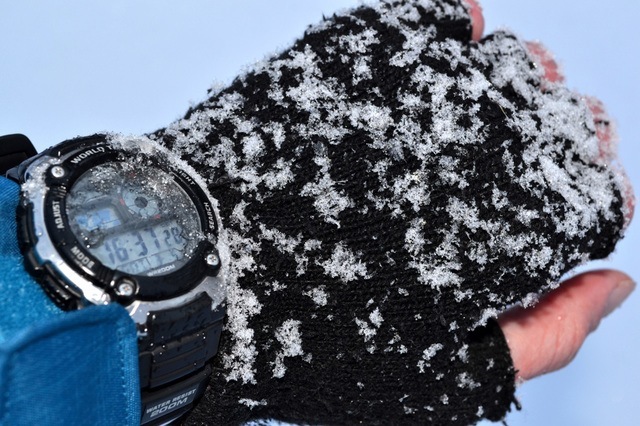 The watch can withstand low temperature up to 14F. This is a beautiful feature for hiking trips in winter or under extreme conditions. The downside could be the lack of a digital compass. However, if you already have a trusted compass beside, there is no need for an additional one. What I particularly fancy about this watch? It is an analog watch. Personally thinking, it’s easy to read time from analog watches than digital ones. Though it can vary from person to person. All in all, I am convinced that this is an affordable option for those who take a keen interest in a watch with a sporty look and reliable features. Casio isn’t a stranger on the market. 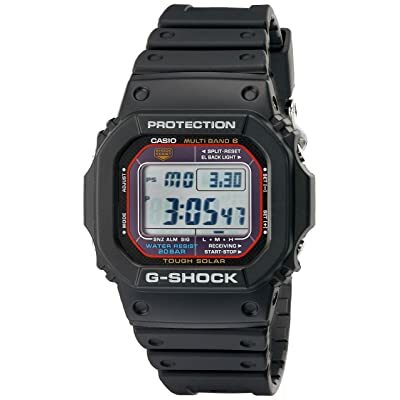 However, it is the G-shock series that brings reputation and status to Casio. GWM5610-1 is a classic example of G-shock series. Those who fell in love with Casio at the beginning of its journey may also be inclined to the square-like case. Compared to their counterparts in G-shock series, the case diameter is relatively small, but it perfectly fits for an active lifestyle. This model has all the essential functions of a digital watch: stop-watch, alarms, and world time. Another feature that makes GWM5610 a suitable timepiece for perfectionists is the automatic synchronisation. This allows the watch to connect to different radio towers to provide accurate, up-to-date time. GWM5610 doesn’t focus on sensors, which is a pity to me; however, it does prove to be indestructible. The shock-resistance is top-notch. You can even find videos in which it was dropped from 14-stories building, or boiled but still functioned flawlessly. The watch operates on solar energy. I’m not going to lie, but this watch can work continuously for 10 months without any light exposure. If you ask me, I’ll definitely say yes to this watch. Though its lack of sensors could be a bit of trouble, its sturdiness and competitive price counteract for all. Timex T49612 belongs to Timex’s Expedition series. Timex has carefully designed this watch to emphasise on its rugged look, which is suitable for outdoor activities. Thanks to the quartz movement, this model is able to provide accurate time without frequent winding. T49612 also offers necessary hiking watches’ features such as dial light, shock-and-water resistance up to 660 feet. Resin is used for case material. Resin has long been famous for its endurance for tough conditions. It partly explains why T49612 is I.S.O certified for shock resistance. Another plus from the resin case is its incredibly light weight, so that watch users don’t feel pressure against their wrists. Hikers will find the digital compass a great companion when they are on the road. The compass feature comes with 16 cardinal points gauged in degrees. I still rate it very high based on the design and high level of shock resistance, but it’s you who choose to give it a chance or not. Timex’s watches have been on the market for ages because the manufacturer pays attention to the quality as well as dependability. 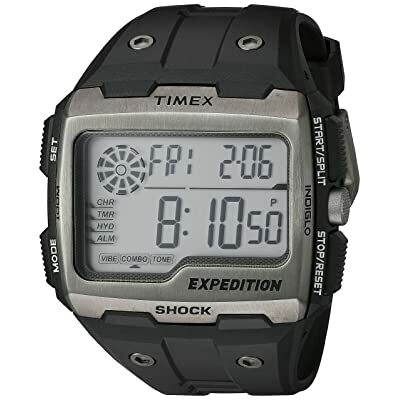 As for the big brother Timex Expedition Shock XL Watch, both value and reliability are vividly portrayed. This watch offers numerous features of an essential watch, such as stopwatch function or alarm. Thanks to its resin case, it has a high level of shock and pressure resistance, which is certified by I.S.O standards. The water resistance stops at 330 ft, suitable for light water sports and occasional marine activities, though it may not be safe to wear it when you do scuba diving or the like. This model doesn’t include a compass, which I consider a big downside for a hiking watch. However, if you are a frequent hiker, having an extra compass isn’t something extraordinary. If there is one thing that can counteract this drawback, it is the attractive design. The large display allows this model to depict specifications more clearly. Case design offers a rugged look. It’s safe to say that this watch looks more expensive than its little brother I have mentioned above. 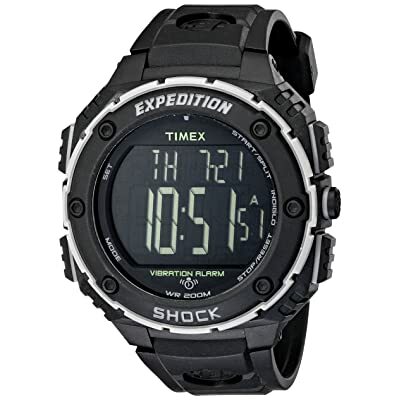 So if you want to to have a reasonably-priced watch with good design, suitable for both casual and outdoor activities, then Timex Expedition Shock XL Watch isn’t a bad choice at all. Stainless steel case with unique rectangular shape, suitable for those who are tired of conventional watch design. Its endurance and shock-resistant ability makes the watch a reliable companion. This model doesn’t include compass. One of the reasons why Timex can still withstand the fierce competition in the market is thanks to its flexibility in designing watches. Time Expedition Grid Shock Watch, unlike other mainstream watches, offers a rectangular face with a stainless steel case. This watch stands out from the rest. Time Expedition series offers quite similar specifications. This series uses quartz movement to maximize accurate time reading. Other features include a stopwatch, alarm and countdown timer. What makes me a bit uncomfortable is that this model doesn’t have a compass. So if you wear this watch for a hiking trip, you may want to bring a separate compass of handheld GPS tracker. Even so, the sturdiness and ability to withstand extreme conditions will make this watch your best companion. All in all, I am convinced that this watch is a product of high value. Those who want to own a uniquely designed watch with useful built-in features would be happy to know that they don’t have to spend a fortune for it either. If you are a frequent hiker, chances are having a hiking watch is the next important thing you need to have besides other hiking clothes. Since you are on a tight budget, overspending for a hiking watch isn’t an ideal option. Typically, you should choose a watch under $100 with essential functions and features for hiking. The advanced features that often found in high-end watches such as GPS or heart rate monitor will not be included in a budget hiking watch. So the question is what I should look for in a hiking watch? There are several key features that you shouldn’t miss. Sturdiness should always take priority over other features for numerous reasons. Hiking isn’t a test of strength and durability for only hikers but also for watches. Not a single hiking trail resembles another. Frequent hikers know what is waiting ahead. It could be either rocky terrain or rough places. Therefore, a reliable hiking watch should be able to endure such hazard and sudden shocks. 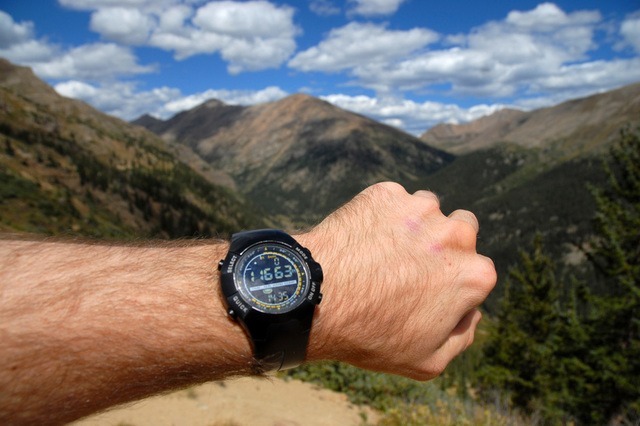 Fortunately, most hiking watches are designed to prolong their durability. The manufacturers often carefully select materials that are shock-and-dirt-resistant, so that watches can withstand even in a harsh environment. You should look for a watch with tough battery life and have a level of water resistance at about 330ft. An altimeter is another should-have feature of hiking watches. Altimeter allows you to measure your altitude above sea level. It often provides more precise and consistent height, especially when you are in a location where GPS signal is unreachable. Knowing the altitude where you are is quite remarkable, since you can locate how high and how far you have been hiking. Hiking watches should come with a compass. You will never know what could happen. Therefore, a reliable compass could provide great help in case you get lost on the trail. No hikers want to get caught under the rain or bad weather during their hiking trip. If anything a hiking watch could be useful for, that is the ability to predict the weather. Barometer, which is an essential feature of a good hiking watch, gages the drifts in the weather. Using barometer, you can predict if the weather is good or bad and make the decision when to stop. An extra incredible feature of hiking watches is a thermometer. The thermometer allows you to predict the next phase of your hiking trip by measuring the outside temperature. Most hiking watches’ thermometer can gauge the temperature within a range from 14F to 140F. Sometimes, the measurement is only estimated, however, it could give you a glimpse of what the temperature like. Knowing that finding a suitable watch for a limited budget could be a daunting task, I have tried my best to gather reviews and information to write this article. I hope that my list of the best-hiking watches under $100 can be of some help to you. Remember, no matter which watches you end up buying, going through the list and guideline first is the key to a successful purchase.